This car is referred to as a heavyweight “Harriman” style 60’ Combination Coach-Baggage Car. 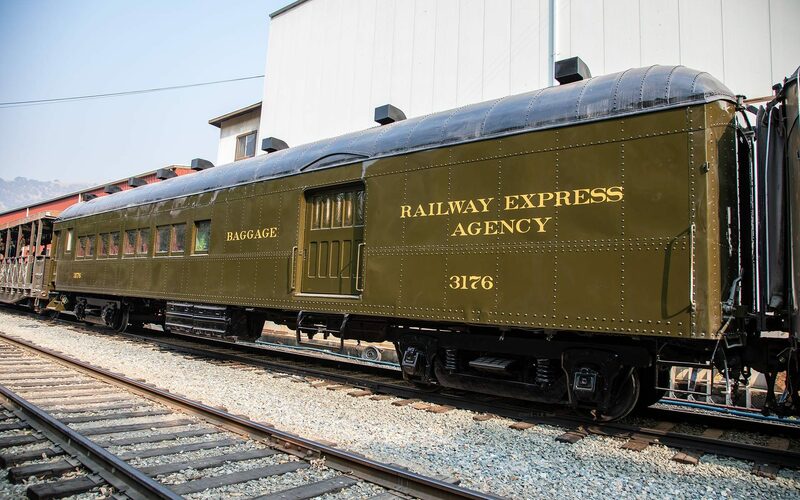 The car was originally constructed by the Pullman Company, Lot 4396, Plan 2925, in February 1916 to Southern Pacific (SP) Class 60-CB-1 for the Arizona Eastern Railway (AE) as their #453. On December 31, 1924, when the AE was absorbed into the SP, the car was renumbered as AE #3176; and again renumbered as SP #3176 in 1932. In 1946, it was shopped, upper window sashes were plated over and the car painted into the famous “Daylight” paint scheme for use on the SP’s “Sacramento Daylight”, trains 53-54. It served in this service from 1946 to late 1950’s. After being retired in 1961, it became the property of the California-Nevada Railroad Historical Society (“Cal-Nevada”). The car served the society on various sponsored excursion trains, which included a well-documented trip on the SP to Northern California for a trip over the McCloud River Railroad from Mt. Shasta City to Pondosa in June 1962. This excursion included the McCloud’s steamer #25 and Yreka Western steamer #19. For a short time in 1969 – ’70, the car was on loan to the Pacific Locomotive Association, undergoing repairs, and where it served on its Castro Point Railway museum in Richmond, CA. In 1971, Cal-Nevada arranged a lease with the Sierra Railroad for use on its regular tourist and movie service; including as part of its “Rail Town 1897” at Jamestown, CA. While there, it received a new paint job into Dark Olive Green (sometimes aka: “Pullman Green”), and another re-lettering as Sierra Railroad #3176, and later named “Calaveras” #11. On February 1, 2014, Cal-Nevada membership generously donated the AE #453 to the PLA for permanent care, use and display. In late 1961 or early ’62, Cal-Nevada President Eldon Lucy and member Bruce Heard discovered the car stored on a scrap track in Sacramento. They were able to rescue the car from certain demise on behalf of Cal-Nevada Railroad Historical Society. A compilation of historical data/facts accumulated from the SP&TS book “SP Passenger Cars, Vol.1, CNRHS “50 Years” booklet and various member recollections. As a memorial tribute to the late Sy Stein by an anonymous donor.